Frost covers the grass in the front garden. Despite everyone’s claims that spring has arrived, the California girl in me disagrees. So, I refill my tea and turn on the radiator. It’s been two years since my husband, Rodger, and I moved to the city of Cork in Ireland’s picturesque southwest and, having lived only in Texas and California previously, the concept of a winter season is still fresh to me. As much as I wish for warmer days, the weather won’t be rushed. Nothing in Ireland is rushed. If there is one thing I have learned during my time here, it is to embrace a different relationship with time. I once thought of “island time” hand-in-hand with palm trees and frosty umbrella drinks. But, the same slowed-down pace exists on the Emerald Isle. In the part of my life which I now refer to as B.I. (before Ireland), days were ruled by over-crowded schedules and mile-long to-do lists. Busyness was glorified. Conversations with friends focused on who had the most responsibilities and who’s plate was the most crowded, like some sort of bizarre over-achiever competition. 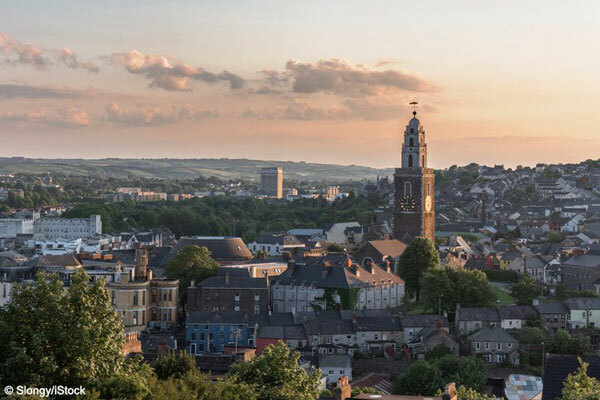 The bell tower of St. Anne’s Church, Cork City at sunset. Here, it’s relationships that are glorified. Sure, hard work is essential, but, busyness is shoved aside in favor of a way of life that focuses on people. No matter where you live, time is a resource. In some places that resource is typically used to add another dollar to the bank account or another accolade to the resume. In Ireland, time is used to bond with family, build community, and care for yourself. There is time to sip tea with a neighbor, to chat with the postal delivery person, or to linger over a pint and a song in the local pub. It’s quaint and cute, but it’s also freeing. This relaxed sense of time might mean that deliveries take longer, meetings start a little late, or things don’t happen as quickly as you might hope. But, that’s okay. There’s no rush or hurry, and everything will get done, eventually. This slowed-down relationship with time isn’t just a mindset; it’s an established part of the culture. Full-time employees in Ireland receive 20 days of paid annual leave and at least nine paid holidays. It’s common for families to take month-long vacations to travel together, or just to decamp to the countryside or beach for weeks at a time. 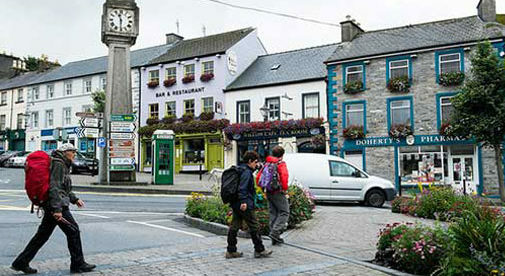 In a country where the landscape is polka-dotted with medieval castles, and ancient cathedrals snuggle next to modern office buildings, it shouldn’t be a surprise that the Irish take the long view of time. As winter turns into spring, I’m setting aside my schedule. You can find me with my feet propped up, sipping another cup of tea in front of a crackling fire.